This is indeed a trying time for the owner of Air Peace as the airline company has become a subject of ridicule since one of its aircraft was engulfed in smoke while landing in Lagos recently. Barely 48 hours after that disaster, another incident has been reported and this time around it involved two aircraft belonging to the airline. 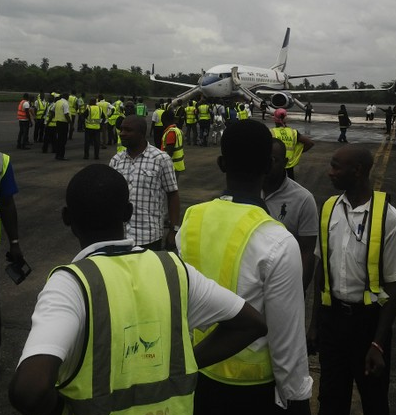 The ground collision happened at the Murtala Mohammed Airport, MMIA in Ikeja today while one of the aircraft was trying to manoeuver its way out of the apron wing of the local terminal of the airport.